The best way to reach out is to make it quick and easy for your staunchest supporters to redistribute your prepared material, while still encouraging them to come up with their own compelling message for your event, publication, product, organization, or advocacy campaign. 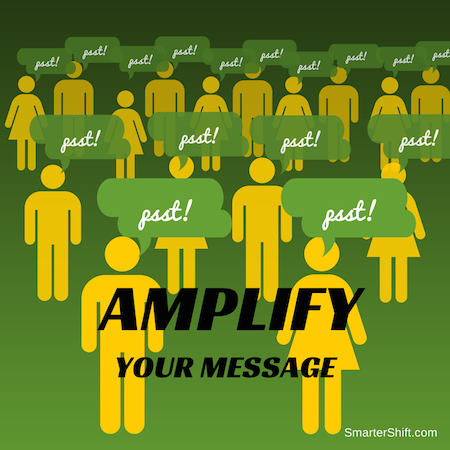 The first step to online amplification, and the most common, is to post your own content on a regular schedule and count on your established network to help you get the message out. The next level is a technique we’ve seen on and off over the last couple of years. It involves preparing a series of tweets and asking a group of brand advocates to distribute them over a fixed period of time. Last week, we saw our #eventprofs friend Liz King adopt the technique and take it a step farther. Her share page for the upcoming techsytalk LIVE conference includes four prepared tweets, a sample e-newsletter blast, and an invitation to share a registration promo to qualify for a registration discount. The great benefit of a share page is that it gives your invitation some permanence online: rather than counting on your online community to notice a message that will essentially disappear within a few minutes on Twitter, or a few hours on any of the other major social platforms, anyone who visits the techsytalk LIVE site will have a decent chance of visiting the share page and taking action as they see fit. But depending on your product and message, there may be a pitfall to avoid. A couple of years ago, I agreed to participate in a Twitter promo for a promising product that was just about to launch. I was given a series of prepared tweets, with links to supporting content and strict instructions to release them on a fixed schedule. The content sounded interesting and credible. But because the links wouldn’t be live until the last minute, I was being asked to endorse the content sight unseen. That was a problem, since I knew my own credibility would suffer if I ended up retweeting material that was weak, uninteresting, inaccurate, or incomplete. And although I doubt the organization intended this, the cloak-and-dagger tone of the whole venture made it seem sneakier than it needed to be. After a couple of rounds of negotiation, the marketing team allowed me to review the articles behind the links. I sent out all the tweets, sometimes with revisions that made them more genuine and, I hoped, more useful. Start out with a standardized share page. Liz King’s techsytalk LIVE page is a good example. Give your brand advocates the option of touring your campaign site and coming up with their own, unique messages. For bonus points, offer a prize for the first 20, 30, or 50 visitors who distribute unique messages, or a grand prize for the best message. If your content is confidential until the tweets go out, but you want a dozen or so of your closest contacts to help you promote it, find a way to share it with them in advance. If you have to, ask them to sign a non-disclosure agreement. But don’t expect anyone in your online community to redistribute material they haven’t had a chance to see and assess for themselves. If they’re that lax about their own online reputations, you may not want to place your reputation in their hands. Even a simple, standard share page is a great addition to any online campaign, and the technique isn’t used nearly as widely as it should be. But with a bit more effort and planning, you can make the page even better by letting your brand advocates choose their own path through your content. That way, you mobilize the intelligence and diversity of your network, as well as its breadth and reach. A share page is just one part of an integrated content strategy. Click here for more on a proven approach to content marketing. B2B Marketers: Ready To Identify And Mobilize Your Brand Advocates?